Exquisite handmade apple roses, arranged on a bed of a rich almond sponge cake, topped with cointreau flavored Mascarpone Cheese I had first made this cake for our anniversary couple of years ago (as you can see never got around to blog about it 🙂 ) The husband loves simple sponge cakes and is not a great fan of cream laden cakes. I usually don’t care at all for cakes-yes that’s true. So I made a simple almond flavoured Victoria sponge cake.The sponge was topped with some jam and a thin layer of cointreau flavoured mascarpone. I love this rich tangy Italian cream/cheese. You can also use whipped cream if you like. 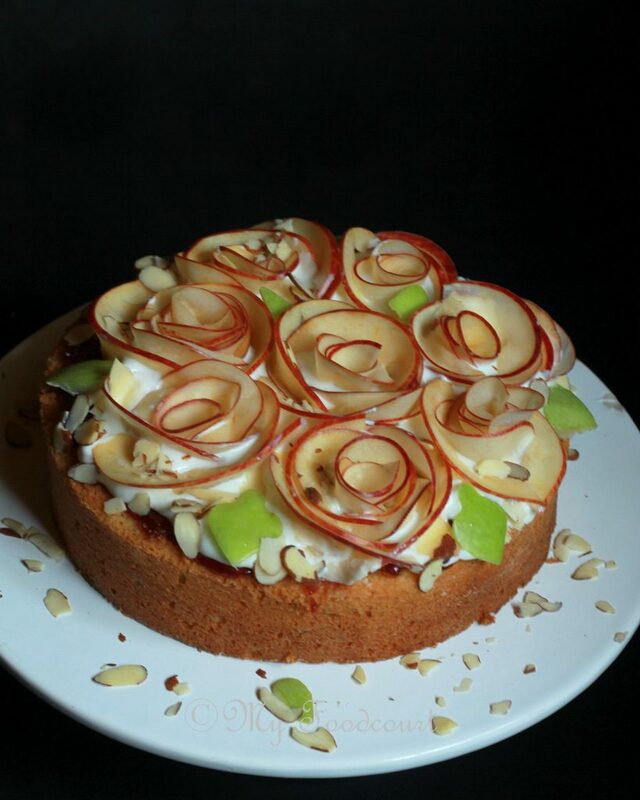 I had seen apple rose tarts on pinterest and so decided to top the cake with some apple ‘roses’. It was fun making the apple roses, though it requires little bit of patience and skill. 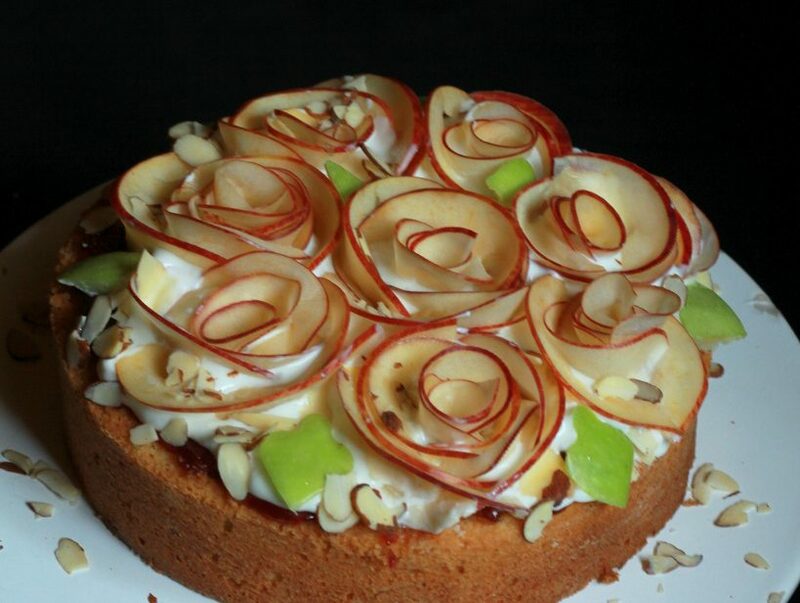 The lovely apple roses made the humble cake look like an exquisite piece of art! I have made this cake many times after that and it is always received with lots of oohs and aahs! 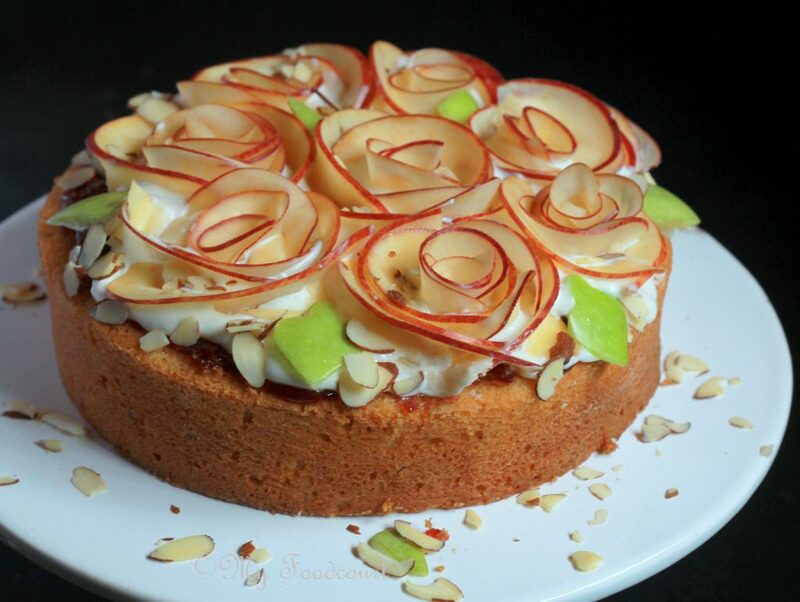 🙂 All the flavours mingle so well and it looks as if I have spent hours slogging over it in the kitchen 🙂 This Valentine’s day gift your loved ones a bouquet of exquisite handmade apple roses, arranged on a bed of a rich almond sponge cake, topped with cointreau flavored Mascarpone Cheese. Prepare a 9 inch baking pan. Sift the flours and salt if using. Beat the butter and sugar together in a mixing bowl, till light and fluffy (Use a wooden spoon or hand blender to whisk). Gently fold in the flours. Core and cut the apples in half. Cut thin slices (use a mandolin slicer for this). 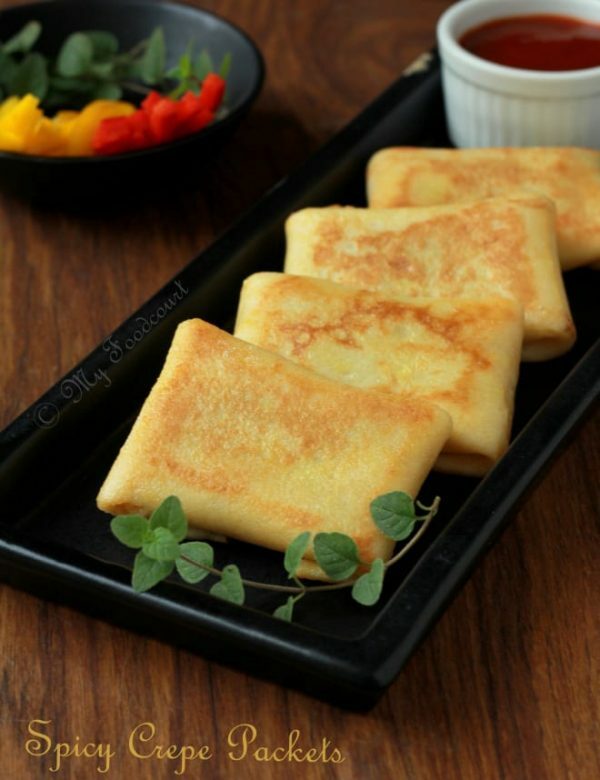 Place the slices in a microwave safe bowl with little water and lemon juice. Microwave for 2-3 minutes till the slices are little soft. This may need some practice. 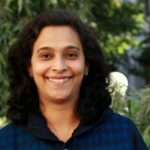 Also you will have to do this in batches. Tightly roll one slice to form the inner petal of the rose and place on the cake. Overlap with other slices and press tightly to form a rose. Repeat till the cake is covered with roses.